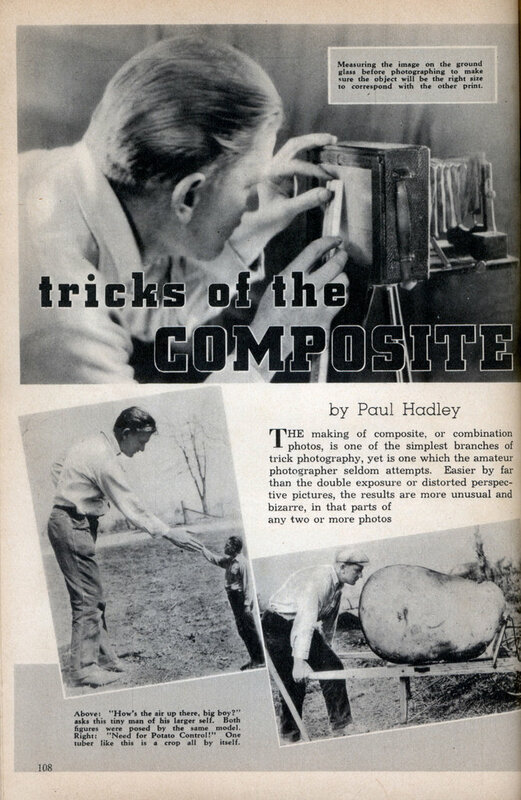 THE making of composite, or combination photos, is one of the simplest branches of trick photography, yet is one which the amateur photographer seldom attempts. Easier by far than the double exposure or distorted perspective pictures, the results are more unusual and bizarre, in that parts of any two or more photos may be combined to make a freakish result. Professionals often resort to this method in making “photomontages,” which are often seen in publications. Probably most of you have seen the novelty photo cards in which, for instance, a wagon is seen creaking under the weight of two giant apples which it is carrying to market, or perhaps an ear of corn being loaded on a flat car with a derrick. Many other variations of this type of picture are to be found, all of which were made by the simple method of combining parts of several prints to make a whole. No expensive photographic equipment is necessary in making these pictures. One should, of course, use a camera on which the image can be seen full size on the ground glass before making the exposure, and which has sufficient extension of bellows to allow copies to be made of the combined prints. The larger size plate of film accommodated by the camera, the better, for this gives you a better chance to study the composition of the picture before making it. A copy lens, which can be purchased from any supply house, will enable you to make closeup photos or copies on cameras which do not have the double extension bellows. The possibilities of composite photos are infinite, and the results you will obtain are limited only by your imagination. The accompanying illustrations show examples of a few of the effects. 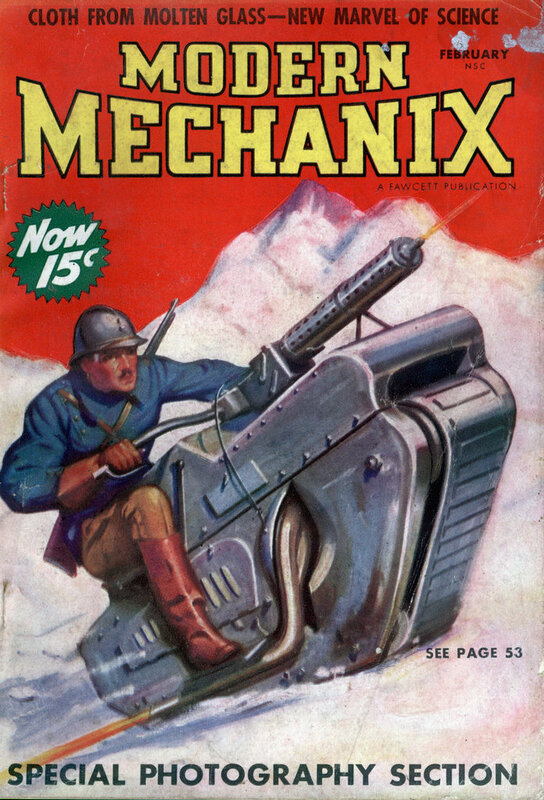 One shows a modern huntsman armed with a repeating rifle about to do battle with a “prehistoric” monster which appears to tower far above the man as it comes over the brow of a hill. In making this picture, the first step was to make the picture of the bug. For this purpose, a dead rhinoceros beetle was obtained from a bug collection and placed upon a small square of sod set upon the studio table. A white cardboard background appears as sky, and the towering effect was obtained by placing the camera lens an inch or two lower than the bug, and pointing up at it. A time exposure by the light of a window produced this first negative. The next thing done was to get the picture of the hunter. Carefully measuring on the bug negative the height at which I wished the hunter to be, a second negative was made, (outdoors) of the man, getting far enough away to get an image of the size to correspond with the idea of the picture. This was ascertained by measuring the image of the hunter on the ground glass with a small ruler before inserting the plate and making the exposure. When prints of both negatives had been made, the figure of the man and gun was cut out with a scissors, scraped to extreme thinness at the edge, and pasted to the surface of the bug print. This was then copied exact size through the same camera on process film to obtain good contrast. The procedure was exactly the same with all the other pictures. In the potato view, the man pushing the wheelbarrow was made first, then the potato photographed to correct size, and pasted on. The man shaking hands with his tiny counterpart is another example of what can be done, in this case both photos being taken out of doors, with the light coming from the same direction. This is one thing that should be noted when selecting pictures to be combined togetherâ€”the lighting should be coming from the same, or nearly the same, direction in both prints. To go back to the print of the bug and hunter, notice how the light is coming from in back of the bug and striking the hunter in the face, as though both coming from the same source, yet one was made outdoors, the other in the house. Scraping the edge of the print, as illustrated in one of the photos and mentioned before, is done to make the edge extremely thin, so it will lie as flush as possible with the surface of the larger print when pasted down. This will eliminate the possibility of the edge of the paper showing in the copy as a light or dark line. The edge may be scraped with a razor blade, or even rubbed down with fine sandpaper, but of course you should be careful not to wear down or remove bits of the edge of the picture itself. A few other effects possible, just to start your imagination to working, would be to have a large image of yourself towering above your home, which is reduced in size to look like a small doll house. Or to reverse the procedure, you could be small enough when placed upon your doorstep to make the house look like the abode of a giant. If you are a flower or garden enthusiast, have a picture of yourself walking through your garden, with the blooms of the poppies towering far above your head, or show yourself attacking one of your cornstalks with an axe. A fisherman could be shown with a trout or bass being brought home on a truck, as an example of one that did not get away. But such bizarre examples are not the only uses to which combination photography may be used. If you have photos of two or more of your friends or relatives taken separatively, these may be combined into one picture to look as though they were all taken together. Size of the different prints does not matter, as the images may be reduced or enlarged in the camera to correspond. Another thing that is important is copying the” prints to obtain even lighting. Of course, if you have regular copying equipment, this becomes a simple matter, as the lighting is part of the equipment. Any camera with a ground glass back and which uses plate or film holders may be used for copying. Extending the bellows topfull length enables you to get up close enough to the print to get a large copy. The camera should be set on a table or tripod, and the print on any suitable support, so it is exactly parallel to the ground glass, and centered with the lens. # By having the print directly facing the window, flat lighting may be obtained, or by placing the camera so light will fall on it evenly from two windows. By doing the latter, you will have no difficulty in light reflections from the surface of glossy prints, which sometimes ruin the copy. Ordinary film or plates are not suitable for making the copy negatives, as they do not have enough contrast. Special film and plates, known variously, as slow, copy, or process, have much more contrast, and are obtainable for any plate camera. These films are from five to ten times slower, how-ever, than regular film, so give from five to ten times the exposure. As a rule, these films and plates give more contrast with overexposure than with underexposure. All the photos illustrating this article were made this way. The originals were on regular portrait film, the finished combination copies on process film.